Several Member States in the WHO European Region are moving towards becoming “tobacco-free”, which means having a smoking prevalence of 5% or less. To achieve this, countries must address a number of tobacco-related issues that specifically impact children, and work to protect children from the harmful effects of tobacco. 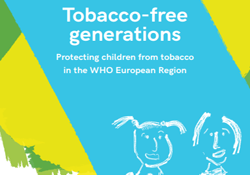 A new report from WHO/Europe identifies tools and offers novel approaches that can – and should – be used to pave the way towards a tobacco-free Region. A series of web stories highlights some of the report’s key findings and recommendations, and shares examples of measures being taken within countries of the Region to fight the harmful effects of tobacco. Of the nearly 900 million people living in the Region, roughly 252 million (28%) smoke. Of these, half will die prematurely from tobacco-related causes. On average, smokers lose 20 years of productive life as a direct consequence of tobacco use. The issue of tobacco use is, therefore, a major public health concern for the Region. The impact of tobacco on children and youth is particularly worrying. Second-hand exposure kills over 600 000 non-smokers globally each year, many of whom are children. Causes of such deaths include asthma, respiratory infections and cancer. Exposure to smoke in utero also increases the risk of complications such as miscarriage and babies born with low birth weight and nicotine dependence. Children exposed to second-hand smoke are also more likely to initiate smoking in the future. Despite these facts, the majority of children under the age of 15 in the Region are exposed to second-hand smoke both inside and outside the home. Smoking initiation is a problem that occurs predominantly among children and adolescents, as the majority of smokers initiate by age 18. According to the 2013/2014 Health Behaviour in School-aged Children survey, 17% of children in the Region try smoking by age 13, and 12% are smoking regularly by age 15. Children can begin to demonstrate symptoms of nicotine addiction within just days or weeks of first smoking, long before a habit of daily smoking develops. Furthermore, the younger the age of initiation, the more likely children are to develop an addiction. It is estimated that 3 in 4 children who smoke in adolescence go on to become daily, addicted smokers in adulthood, even if their intention is to quit within a few years. In Scotland, United Kingdom, the project REFRESH – Reducing Families’ Exposure to Second-hand Smoke in the Home – aims to protect children from second-hand smoking in a way that is nonstigmatizing to smokers. This involves going into the homes of smoking parents with young children to measure indoor air quality and provide tailored education and advice on how the smoking situation can affect their children’s health. Such an approach is sensitive to the specific conditions of parents, and has been reported to have a positive influence on the smoking behaviour of parents in the home.